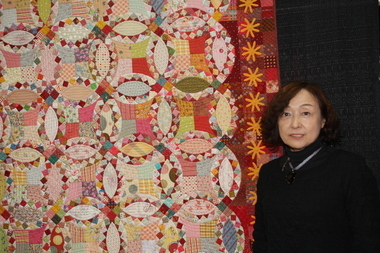 Japanese quilt artist Etsuko Matsuda poses in front the quilt she made for her granddaughter at the Quilts on the Grand show last weekend in Grand Rapids. Matsuda founded a quilting school in Japan and has been exhibiting her quilts and the work of her students in Grand Rapids show since 1998. This quilt took her two years to complete. – from the Grand Rapids Press. Click here to read the full article in the Grand Rapids Press.